Something I likely don't talk about often enough on Witchy Words is spell disposal. I've done an immense amount of spell work over the years involving my home, unsurprising as a cottage witch, but I've never featured how I dispose of these spells. As I begin my transition from renter to home owner, I plan on going through each spell we have and breaking them step by step as needed. Let's begin with the Home Securing spell I did on the blood moon last year. You can find the original article here if you'd like to read it in detail, but here's a brief overview. 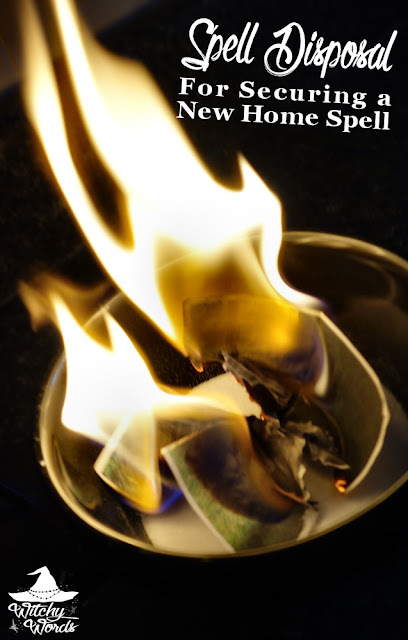 The original spell involved printing out a picture of the home we hoped to rent and writing on the back of it all the details of how we would acquire and keep said house. 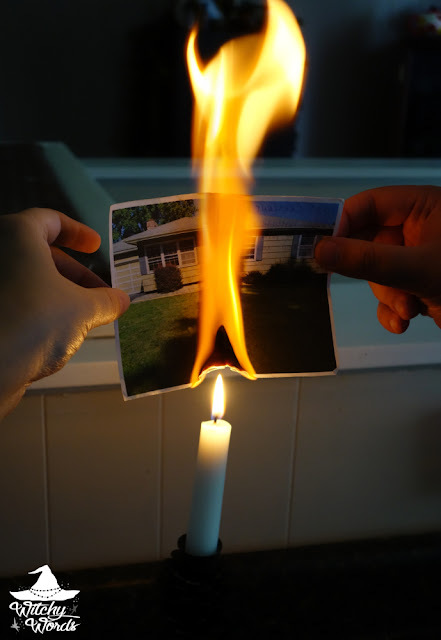 I then anointed a candle with an oil from Magical Moody Moons and placed that candle on top of the photograph. My husband lit the candle and I charged it under the light of the full moon. 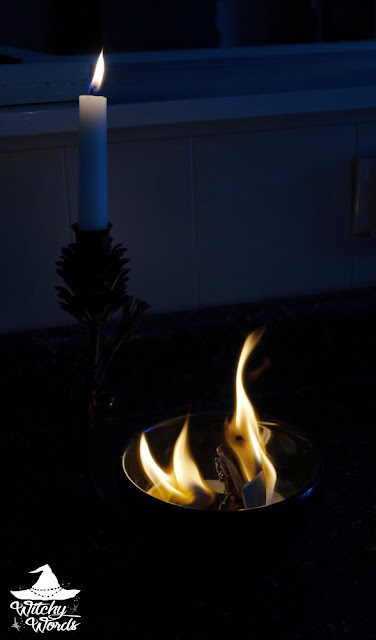 We then allowed the candle to burn out. Once it was completed, I folded and placed the picture under a magnet that I kept with me at all times. That picture never left my wallet, which closes with a magnet specifically for this purpose, until we were officially approved for a mortgage and had decided to move. To be honest, I had almost forgotten about this spell until we were having very little luck finding a home. I then realized that we were still attached to the rental property via the spell above. I grabbed my husband and we broke the spell in a matter of minutes. Here's how! I took one side and he took the other. Using a candle's flame, we burned the paper in half until it split. We then placed the burning remains in a bowl of salt until the fire completely died. Using a fork, I mixed the ashes into the salt to completely nullify them. Not just any utensil would do; the fork I'm using had to be steel. Steel creates a magickal boundary between you and the remnants. It's important that you do not touch the ashes until they are completely mixed into the salt. So what do you do with the salt? Certainly don't pour it into your local grassy area. Salt's acidity kills off most plant life quickly and refuses to let more grow. If it's a small amount of salt and your pipes are PVC, you can pour it down the drain or flush it down the toilet. For larger amounts of salt, spread it over a gravel road, anywhere you do not want plants to grow or dispose of it at a crossroads on the asphalt or dirt. Oftentimes, salt doesn't necessarily need to be disposed. If the salt isn't mixed with an ingredient to nullify it like above, it might be reusable for other spells. However, since the ashes were inseparable from the salt, this certainly needed to be removed. Because our pipes are PVC and it was a small amount, I simply gave it a quick flush down the toilet. Rather appropriate since the flooding, lack of repairs and thus the whole reason we're moving came from the toilet. Also, never fear: A new spell has taken its place in my wallet. More information coming soon! Happy spell breaking, fellow witchies! Interesting. *blush* I'm flummoxed to say I never thought about salt being harmful to grass! I've always used a small amount so noticed no odd effects in my yard, thankfully. Thanks for bringing this info my attention, and good luck with your house hunt, Marietta! To be totally honest, I only know it's not ideal because I've dumped an immense amount of salt onto grass when I was very young and I still don't think grass grows there. Small amounts won't make much of a difference, but a bowl of salt or more applied to one area probably would kill any plant life off. Thank you so much for your kind words, Juli! I'll have news posted soon! Aww...that's too bad. But you learned not to do it again so there is a bright side! I will say, I don't recall every dumping more than a small cup out, that's true. Looking forward to your updates. I hope all's going well for you! Of course! Good luck with your search for a new home!